Sometimes you notice things, sometimes you don't. 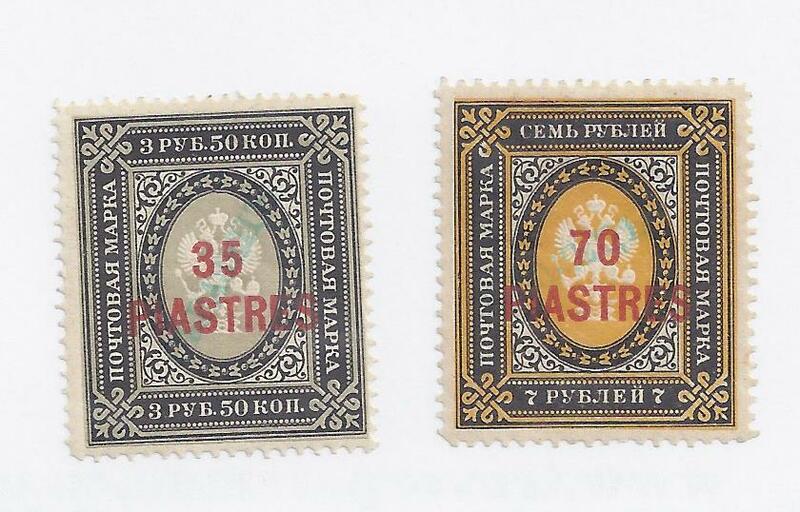 Here are two Levant surcharges on Imperial stamps. In the background you can see some kind of blue diagonal inscription, very weak and unreadable unless you know what it says. 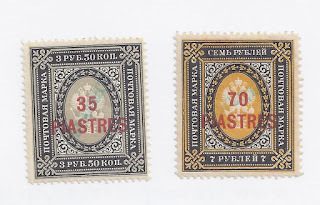 It says OBRAZETS and these are Specimens, even though this is not the usual form of Russian OBRAZETS overprints which are big,bold, unmistakeable and much forged on computers. But if I had not seen these almost invisible blue oveprints before, I would have missed them. I Googled to check that I was right and within the usual 45 seconds had located an interesting Auction lot from Cherrystone where the blue OBRAZETS is combined with a UPU administration's own SPECIMEN overprint. The lot sold for $500. 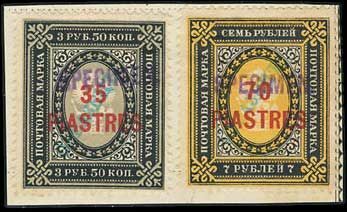 1903-05 surcharged 35pi and 70pi on 3.50r and 7r respectively, each overprinted "Obrazets" (specimen) in blue cyrilic letters, affixed on piece and further handstamped "Specimen" in violet (Samuel ty. NA2), as applied bythe Natal Post Office on receipt from the UPU, fine and possibly unique combination of Specimen overprints, with BPA cert.